Zanskar River originates from the high altitude plateau of Sarchu on the border of Himachal Pradesh and Jammu and Kashmir . Originally known as the Tsarap the river gorges a path out of the rocky mountains of western Himalayas , dropping in a continuous torrent of class V rapids. 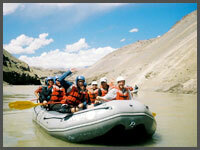 The river then eases into the forbidden Kingdom of Zanskar and slowly flows past the capital at Padum. Here it joins with the Stod river which flows down from the Pensi La pass on the road from Kargil to Padum. Midnight: Around midnight arrival in Delhi . The cosmopolitan city and capital Delhi is the main gateway for travelers. Meet our representative and transfer to your Hotel. Morning fly to Leh. The rest of the day is at leisure to acclimatize ourselves to the high altitude of Leh. It is important to go slow as acclimatisation is critical to your enjoyment. Local sightseeing of Leh, the capital of the historic kingdom of Ladakh . The town is a fascinating labyrinth of winding streets and quaint bazaars. The main street is open and airy, lined with rows of shops. Visit the Leh Palace , Shanti Stupa, and the Leh Mosque. In the noon flight from Leh to Delhi.